Tallahassee home owners considering a sale have most likely heard how tough the housing market is. They might have heard some good news about Tallahassee home sales finally starting to turn around with modest gains over last year's "Worst Year Ever" performance. 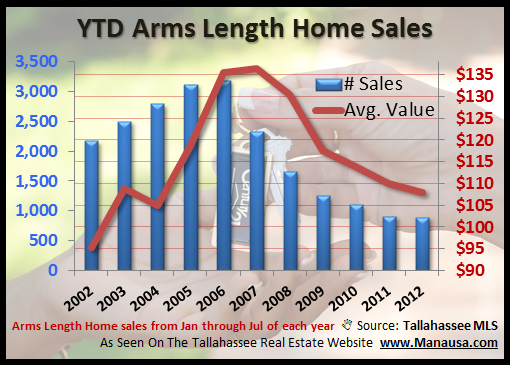 Upon entering the market however, they will find that 2012 is the toughest year on record to sell a Tallahassee home. Yep, that's right, the gains that we see in the Tallahassee real estate market are coming from distressed home sales, not from people with equity in their homes. When we look at the real estate graph above, we see that distressed home sales comprise 37% of the closings in the Tallahassee MLS, and their share of the market is rising. 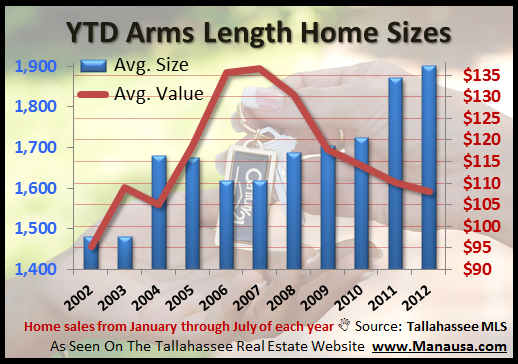 When we look at arms length home sales in Tallahassee, we find that 2012 has seen the worst January through July performance in more than 11 years. In the real estate graph below, all distressed property sales have been removed, revealing arms length Tallahassee home values that have depreciated 2% and the number of sales have dropped about 1% since last year. The average size of arms length Tallahassee home sales is growing. Buyers, armed with excess supply to choose from as well as falling interest rates, are choosing to purchase bigger homes and spend their full budget rather than choosing to spend less money than they can afford. This dynamic is important to understand. Tallahassee home values are falling, even as average home prices are on the rise. Buyers are getting "more house," as the graph above shows. Many real estate reporters are noting rising "average prices," but they are failing to report that buyers are getting rising "average sizes." Interest rates falling have allowed buyers to spend more money, but it does not mean they are still buying the same Tallahassee home. Do not fall into the trap of believing that average prices directly correlate to appreciation or depreciation during a short term trend. I hope this Tallahassee Home Sales Report has been enlightening, please come back and visit the Tallahassee Real Estate Blog for more reports on home values in Tallahassee.